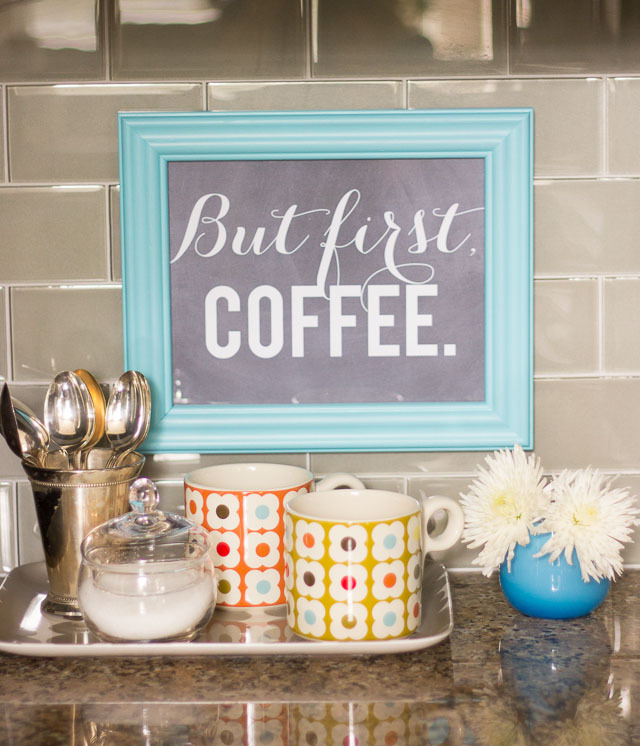 Do you have a morning coffee ritual? It is silly how much I enjoy sneaking in a cup of coffee and a few quiet minutes to myself in the morning before the girls wake up. It almost never happens unless I set an alarm to get up before them, but when it does I savor every moment! It might only be a little corner of my kitchen, but this new little coffee station makes me very happy. 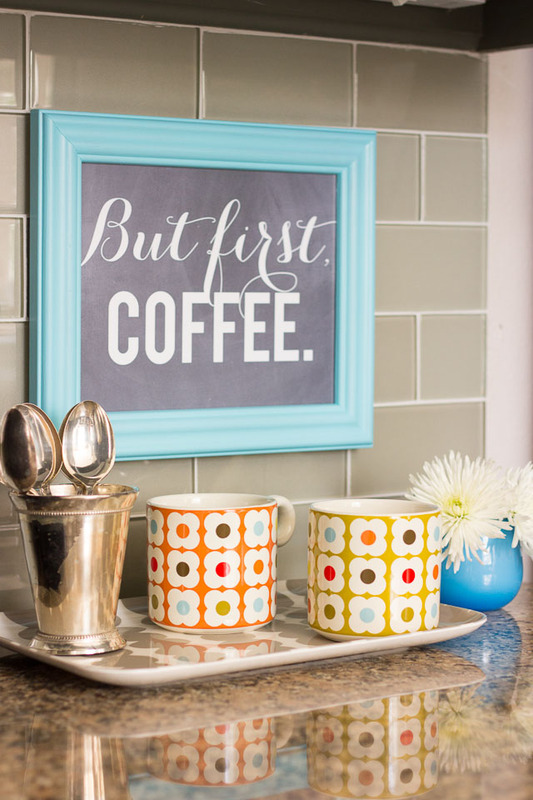 It’s a mix of my beloved Keurig, the colorful Orla Kiely coffee mugs I scored at Goodwill, and this fun chalkboard print from Paper Canoe Printables. Small tray to help set the area apart – I found my tray at a local San Antonio boutique, The Tiny Finch. 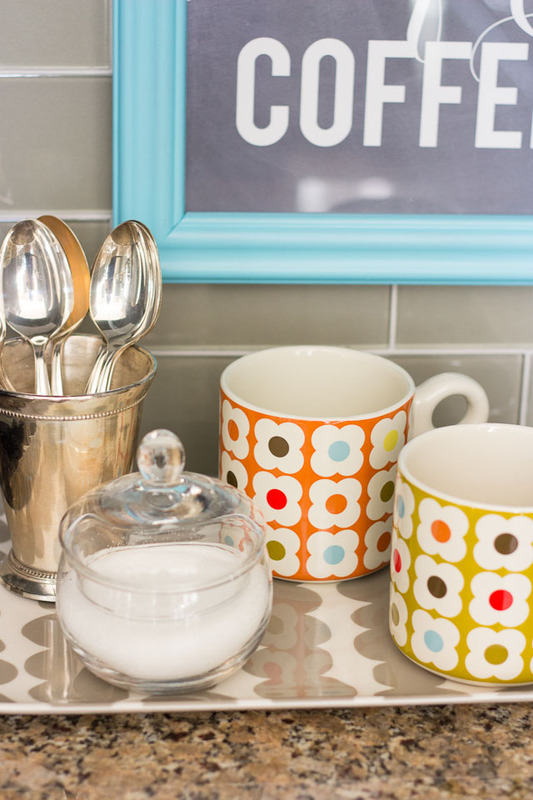 You could also give a makeover to an old tray like I did here. 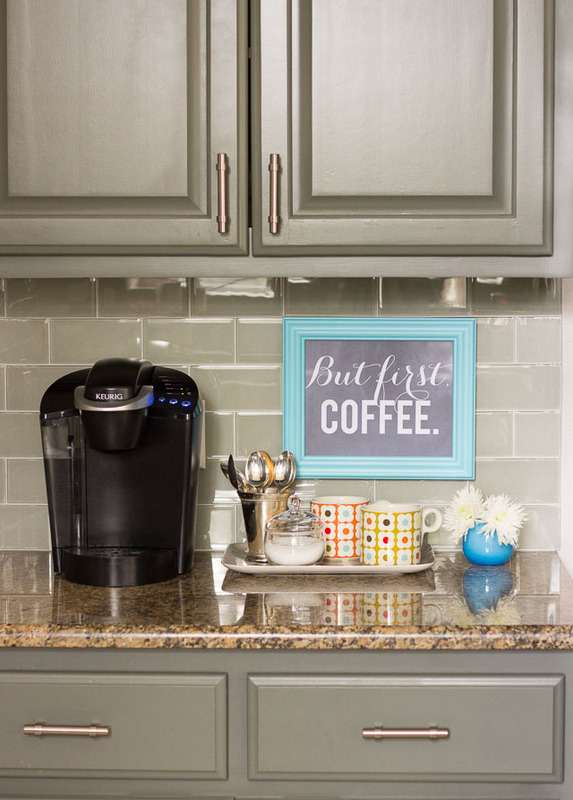 Your favorite mugs – it is fun to set out a couple of your favorites from the cabinet. If they are pretty, all the better! Sugar bowl – if you like sugar in your coffee, it is nice to have it right there on hand. Spoons – I displayed some special spoons from my Grandma in an old mint julep cup. A little art – I love the idea of using art in the kitchen. When I found this great printable on Etsy for only $5, I knew it was perfect. It is my motto most days! 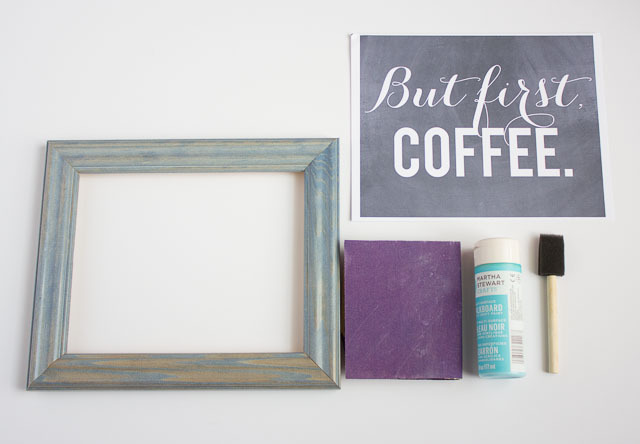 To make my framed art, I printed out the 8×10 printable on card stock and then frame it in an old frame I gave new life to with a little Martha Stewart Blue Chalkboard Paint (any acrylic craft paint would work). I just sanded the frame and then covered it in 4 coats of paint with a small foam brush. I hung the framed print on our backsplash with 3M Command Strips. 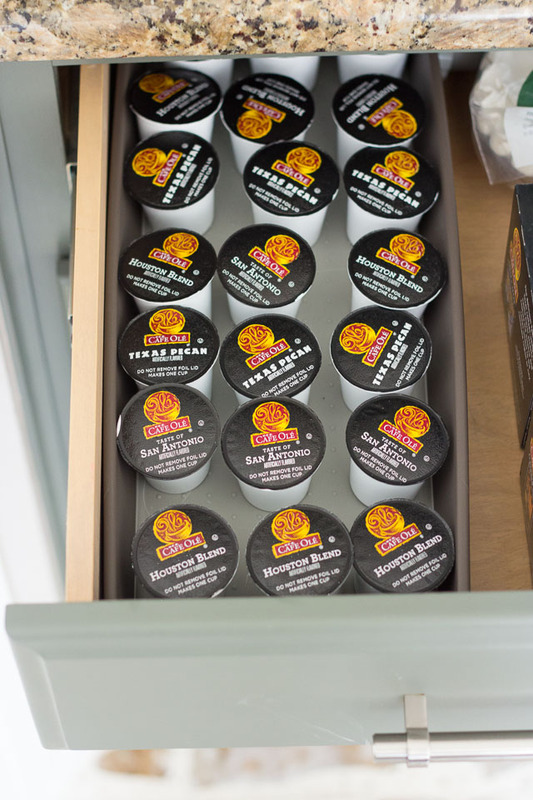 Finally, a drawer below my coffee station holds all my favorite K-cups. I thought you might get a kick out of my flavors – San Antonio Blend, Houston Blend, and Texas Pecan. Ha! I guess I really am a Texan now, aren’t I? A sucker for flavored coffees, I am addicted to our local grocery store HEB‘s Cafe Ole coffee! I hope you get to enjoy a quiet cup of coffee this weekend. 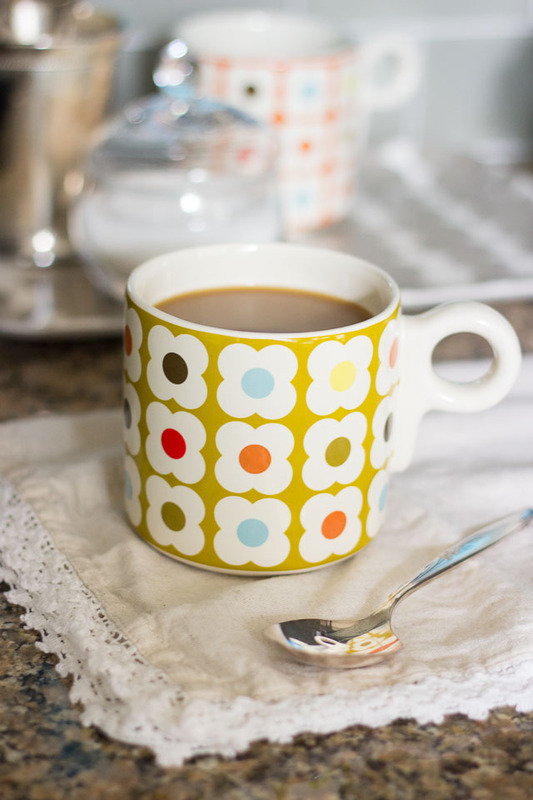 If you are a coffee lover, I’d love to hear about your morning ritual! What is the color of your cabinets? Love them!